It’s been a busy but good week so far. I’ve been so occupied that in fact, I actually made this meal on Saturday and have only tonight got around to posting it! Anyway, if you’re looking for a quick and tasty meal that could be whipped up mid-week or for something simple on a Saturday, this is it. I love Japanese and so my aim was to make a Japanese style salad. 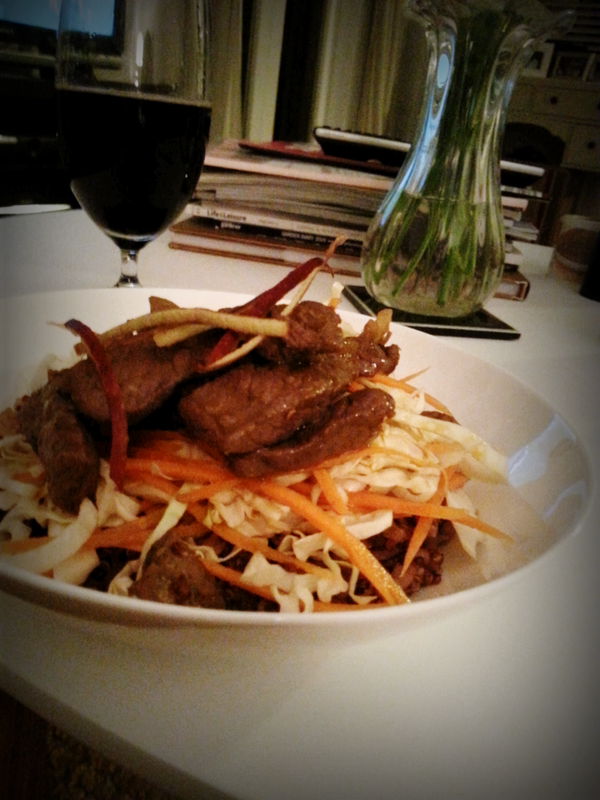 I had a bit of meat in the fridge (in this case, venison – not very Japanese I admit) and I was due to do a vegetable shop so I had a limited selection of onion, garlic, carrot and cabbage. How to make something tasty from these few ingredients? It’s all in the delicious sauce, poured over a bowl of rice covered with a refreshing crisp cabbage and carrot salad and topped with warm stir fried meat strips. The flavours in this meal worked so well that I will definitely be making it again. I’m going to try a fish version next time using salmon and avocado instead of the meat. Combine garlic, ginger, honey and soy sauce then tip over the meat, marinade for at least 1 hour. Combine sauce ingredients and refrigerate until ready to serve. Prepare the salad by finely slicing the cabbage and grating the carrot (grated apple or fennel would also work well with this!). Cook rice by bringing the rice and water to the boil then turning off the heat and allowing to absorb for 15 – 20 minutes. Meanwhile, heat 1 tablespoon of oil in a pan, sautee garlic then add marinated meat and cook until desired. To serve, place the rice in the bottom of the bowl, top with a generous handful of the salad and then the warm meat. Pour over a generous splash of the delicious sauce and enjoy! That looks delicious ! I wonder if Hubby was responsible for the venison ? Thank you! And yes, he sure was! Yum will defo try this one!